PFC helps to coordinate forums and other gatherings to provide private landowners with an opportunity to share their experiences on their landscape with partners and policy makers. These forums are a key venues for public and private partners to share insight on what is working, what could be working better and what may be missing from partnerships, programs and other conservation efforts. In May 2016, Partners for Conservation worked with the USDA-Natural Resources Conservation Service (NRCS) to convened with landowners from across the country to discuss and provide input to the NRCS on the Working Lands for Wildlife partnership, an effort by the agency to focus resources and partnerships on landscapes that are home to species of conservation concern. In March 2016, Partners for Conservation, in partnership with the U.S. 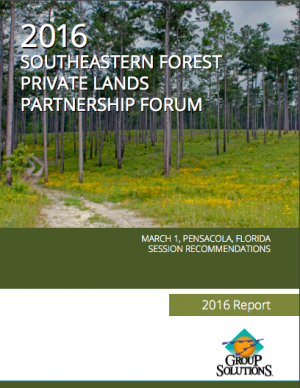 Fish and Wildlife Service, the USDA-Natural Resources Conservation Service, and a host of state and nonprofit conservation partners, hosted a forum in Pensacola, Florida to discuss what is working, what could be working better, and what was missing from public-private conservation partnerships in the longleaf pine ecosystem. 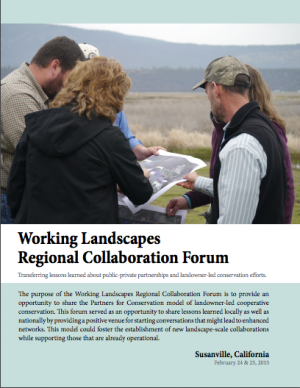 Partners for Conservation, along with other landowners, government agencies, and nonprofit conservation organizations, gathered in Susanville, California in February 2015 to discuss issues of collaboration and partnership to sustain working landscapes in southern Oregon, northeast California and northwest Nevada. Over the course of two days the group discussed obstacles and opportunities to collaboration and partnership in the region. Partners for Conservation, along with the U.S. 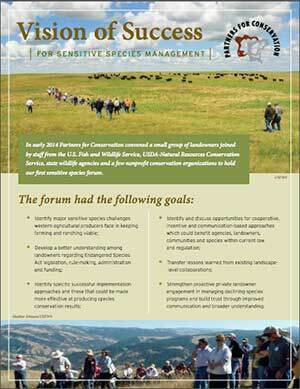 Fish and Wildlife Service, other landowners, and a small group of agency and non-governmental organization partners, convened in February 2014 to increase knowledge about the Endangered Species Act and associated regulations. This forum was particularly designed to increase understanding of private lands concerns with sensitive species management and how collaboration and flexibility could lead to more positive outcomes for landowners, communities and species. 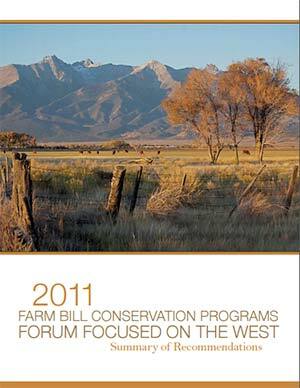 The Intermountain West Joint Venture, Partners for Conservation, and the University of Montana College of Forestry and Conservation hosted the inaugural Farm Bill Conservation Programs Forum Focused on the West (Forum) in 2011. 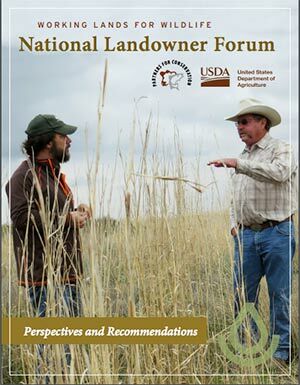 The purpose of the Forum was to bring together landowner leaders and conservation partners from the West to identify conservation priorities and provide recommendations for improving Farm Bill conservation programs. These recommendations were used to help guide policy priorities during the reauthorization of the Farm Bill in 2014.